Lately I have been playing with supplementary weft patterning and, once again, have been inspired by Weavolution members. One member joined my Backstrap Group as she is interested, amongst other things, in reproducing a Central Asian yurt band. 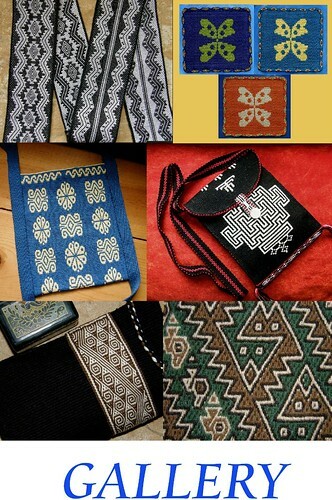 She has introduced me to many beautiful Central Asian designs and often sends me photos of pieces she has seen at reenactmant events that she attends. Together we figured out the technique on a yurt band she had bought and even wove it simultaneously- all coordinated by email! When she sent me this photo (at left) of a Central Asian piece she had photographed at one of the historical events, I couldn’t wait to weave the design into something. The technique wasn’t clear in the photo and, as I wasn’t concerned with reproducing the original technique, I decided to weave it in either double weave or supplementary weft patterning. 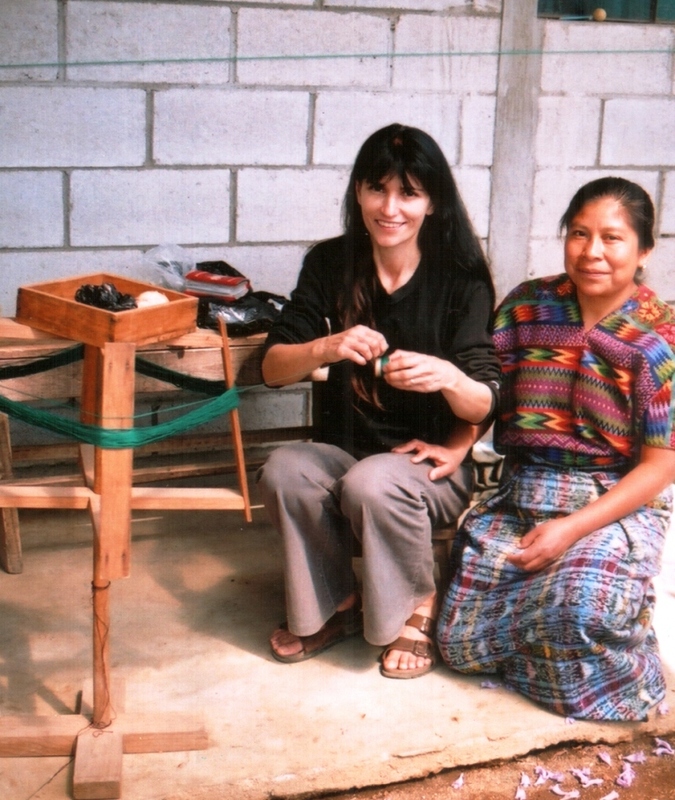 I chose the latter as, since studying this technique in Guatemala in 2008, I hadn’t put it to much use. In this technique, it is really important to get the right balance between the weight of the warp yarn and that used for the supplementary weft and so I quickly wove a sample and then went ahead and made the table runner below in 4/2 cotton (24wpi) warp with 6 strands of the patterning thread that I had brought back from Guatemala as the supplementary weft. You can see that I added a little embellishment of my own to the pattern. My colors are rather bland compared with the original. I love that orange zigzag next to the main design. Perhaps I will be more adventurous with color next time! 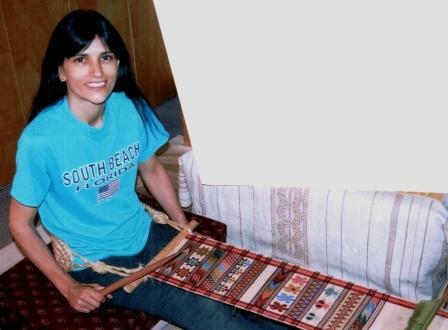 My other source of inspiration has been a Brazilian member of Weavolution who has generously shared what she knows about the weavings of the Huni Kuin people who live in the tropical forest of Brazil and Peru. 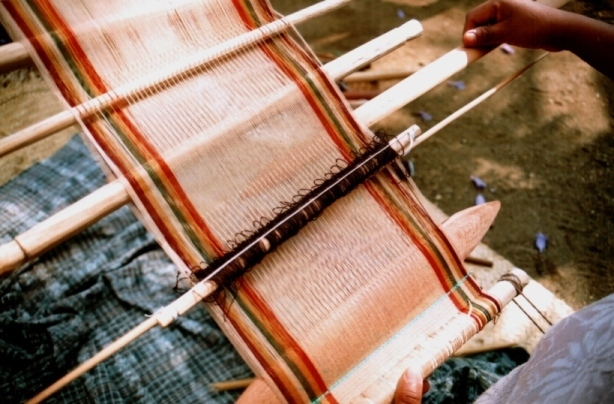 They weave with backstrap looms using cotton that they spin and dye themselves. You can see a video of their work here and a photo of a Huni Kuin weaver here. Although they do not use the supplementary weft technique, I chose to use this method to weave one of their designs into a bag. 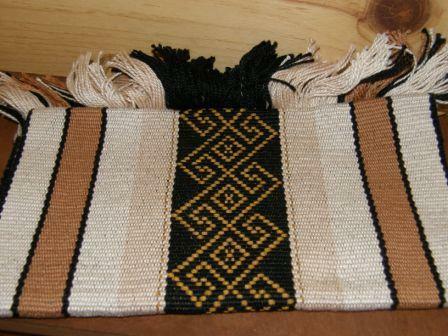 A small bag with supplementary weft patterning inspired by a traditional Huni Kuin design. 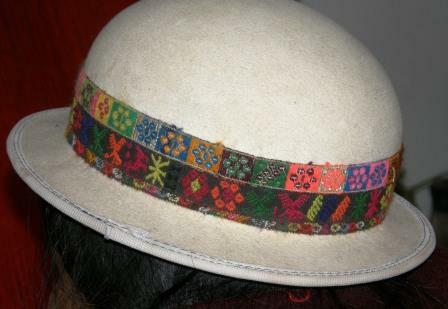 Here in Bolivia, the supplementary weft technique is used by women to weave bands to decorate their hats. 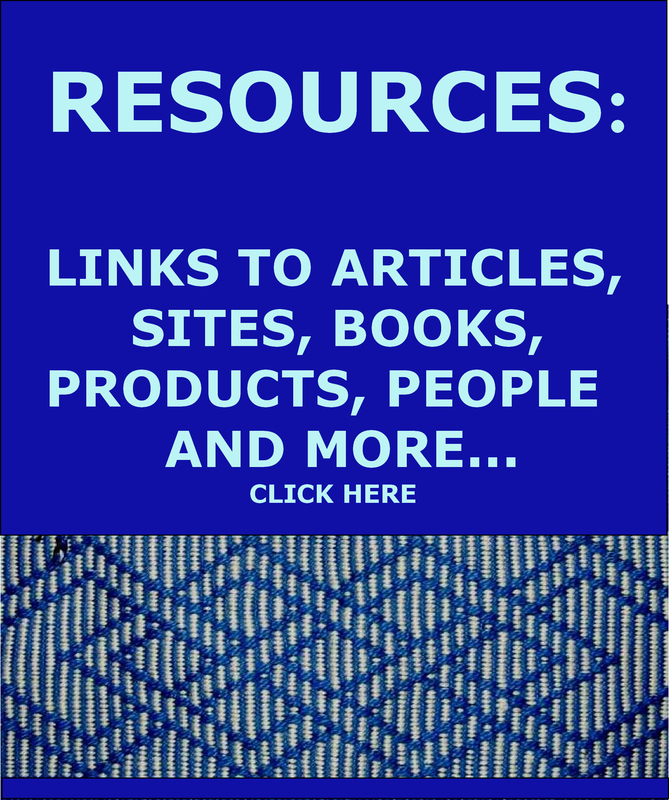 It is in these hatbands that I have seen the widest variety of woven designs. Except for in Calcha, where it seemed that the women had decided on one hatband design to represent their village, I have never seen two hatbands alike. This Potolo woman is using three hatbands at once. 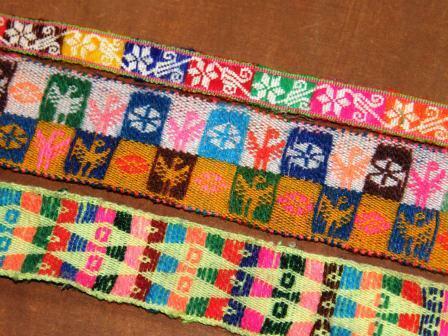 Hatbands from Bolivia. The top band is from Calcha. 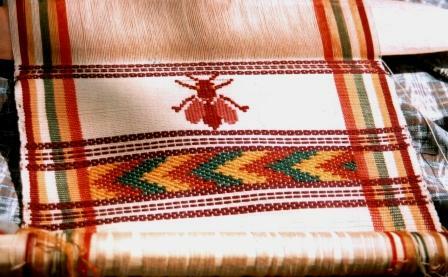 Sometimes the supplementary weft is used to form the motif as in the small condors on the upper half of the center band above. At other times, it is used to fill the negative space to outline the motif on the ground weave. From having purchased some hatbands here, I was able to see how they were woven. I made a few sample bands but, as I didn’t get the right warp to weft ratio, I wasn’t too pleased with the results and never really went on to explore this technique further- that is, until I went to Guatemala in 2008 and studied weft patterning with three teachers there. It was my first time in Guatemala and an absolute explosion of color and inspiration was awaiting! 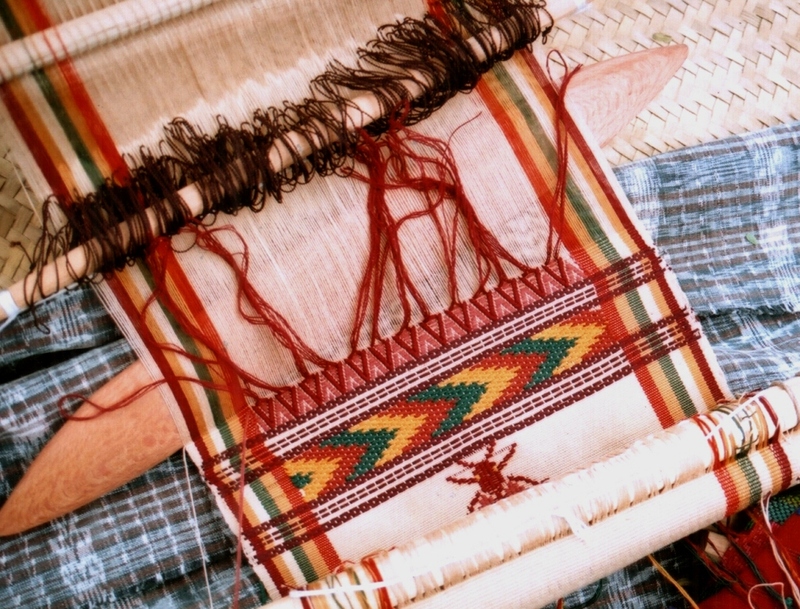 This is the traditional hair sash used by the women of Aguacatan, Guatemala and is woven with supplementary patterning wefts on a plain red ground weave. 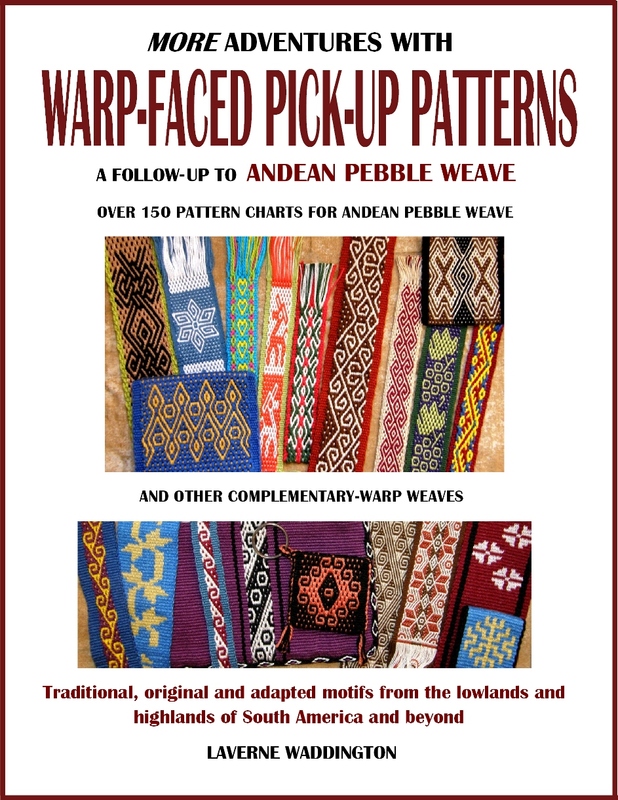 So I would like to spend the rest of this post introducing you to my first teacher in Guatemala and showing you how I learned supplementary weft patterning with her. Lidia lives in the very small town of Santa Catarina Barahona near San Antonio Aguas Calientes in Guatemala. 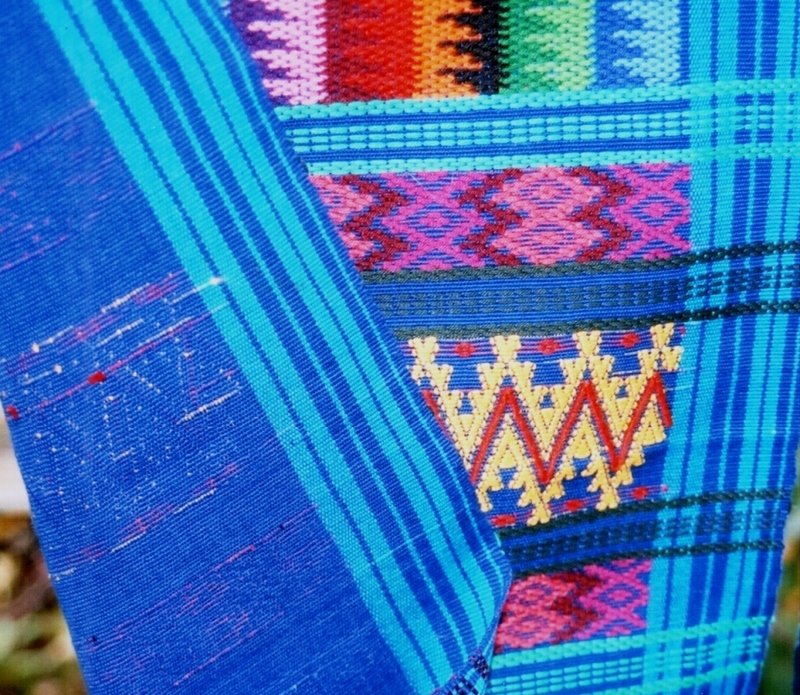 The typical blouse, or huipil of the area has designs woven in single and double faced supplementary weft patterning. The large areas of double faced patterning are those that most distinguish the huipiles of this area. 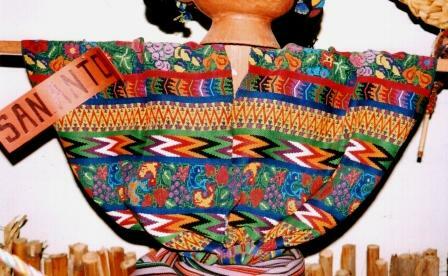 Typical huipil of San Antonio Aguas Calientes. Single faced weft patterning. The patterns can't be seen on the back of the textile. This double faced patterning looks very much like embroidery. 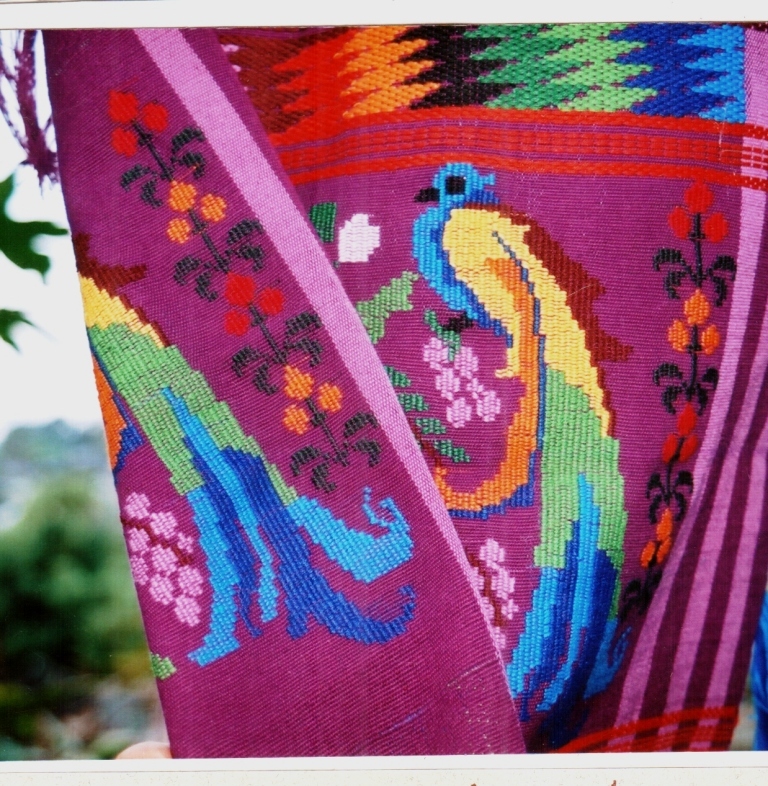 The national bird, the quetzal, is a very popular motif. Making a small warp for my lessons. Once the loom was tensioned, the heddles were made. The heddles were made and the shed rod put in place. 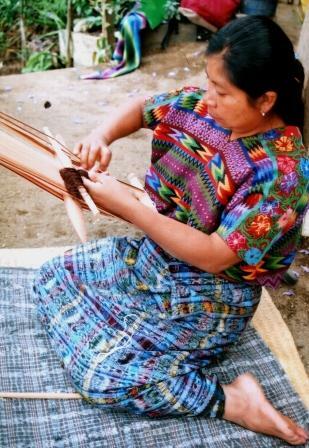 Then Lidia's sister, Carmelita, showed me how the warps, under which the patterning wefts are placed, are picked and stored on two additional sticks. The resulting designs are called ''pepenado''. You can see one of these sticks up beyond the shed rod. Carmelita is in the process of placing the second stick. 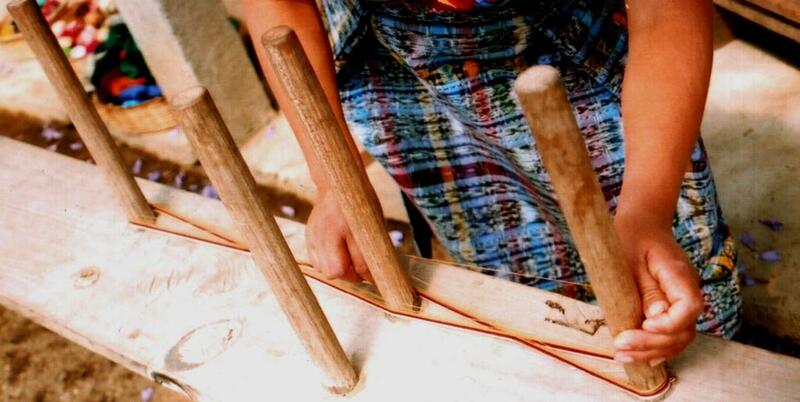 The first design lesson-Lidia is weaving the"tijera" (scissors) pattern-this is a single faced design. 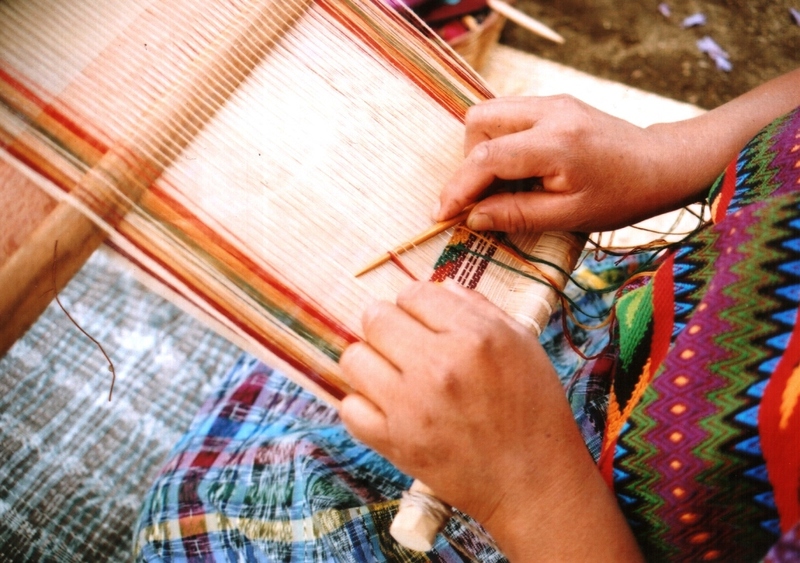 She uses a pointed stick to hook the weft tails and draw them under the raised warps. The second design lesson on day two -a double faced "abeja" (bee). Three "abejas" that I wove when I got home. The ”abeja” was topped off with another section of ”tijera” and that completed my second day of classes. Finally, on day three, I learned the ”arcos” (arches) pattern. This is a combination of weft inlay and warp wrapping. It looks like my teachers did all the weaving and I just stood around and snapped pictures! Well, I can tell you that it wasn’t so. Lidia was a very ”hands-on” teacher and she would take over only when I got up to stretch and take photos. But it wasn’t all hard work. Other family members and neighbors came to visit, we paused to make and eat tortillas, chatted and played with the nieces and nephews in Lidia’s shady yard and walked to town to go yarn shopping. Snack time. 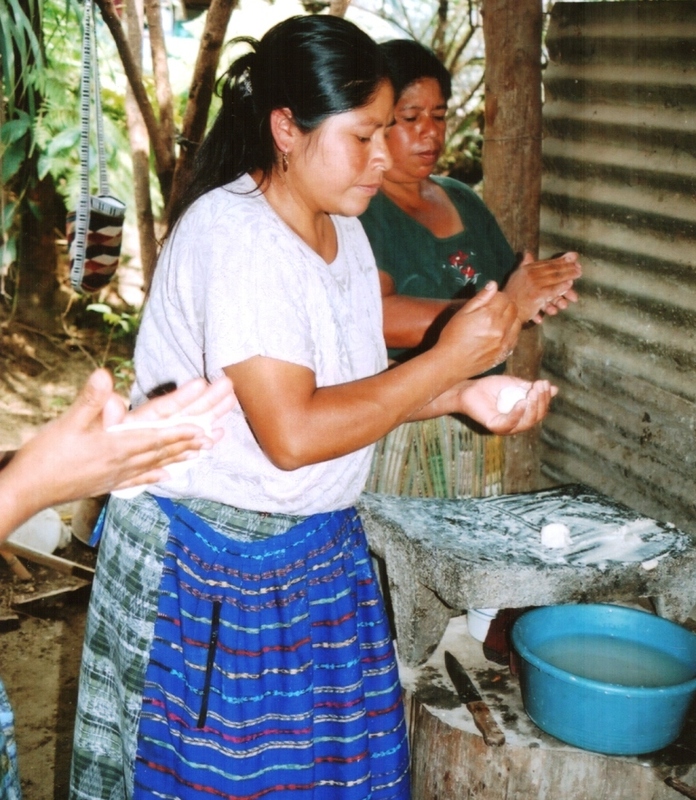 While making my way around Guatemala I learned to recognize the ''slap slap slapping'' sound of tortillas being prepared. Carmelita with her new nephew. 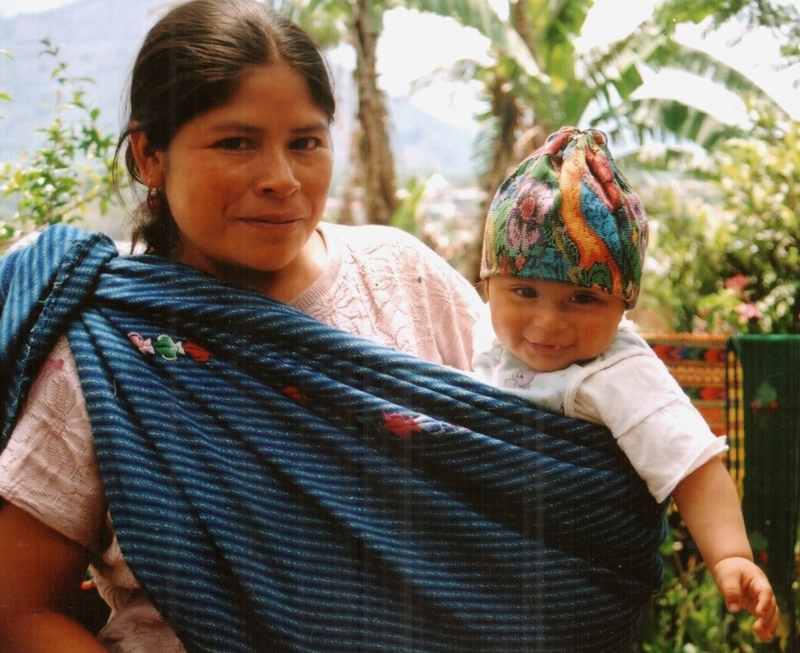 Small woven rectangular pieces are covered with double faced designs and closed with a drawstring to make babies' hats. When I got back to Bolivia, I finished off the piece that I had been making with Lidia and then wove another sampler to consolidate the weft patterning techniques I had learned before writing everything up in my journals. 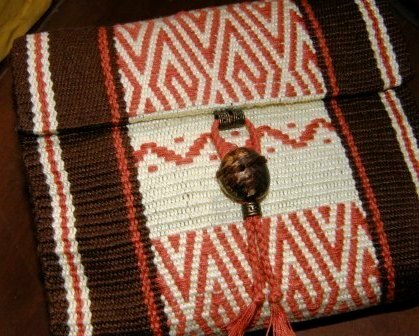 And I used my lesson piece to decorate the lid of my weaving toolbox. 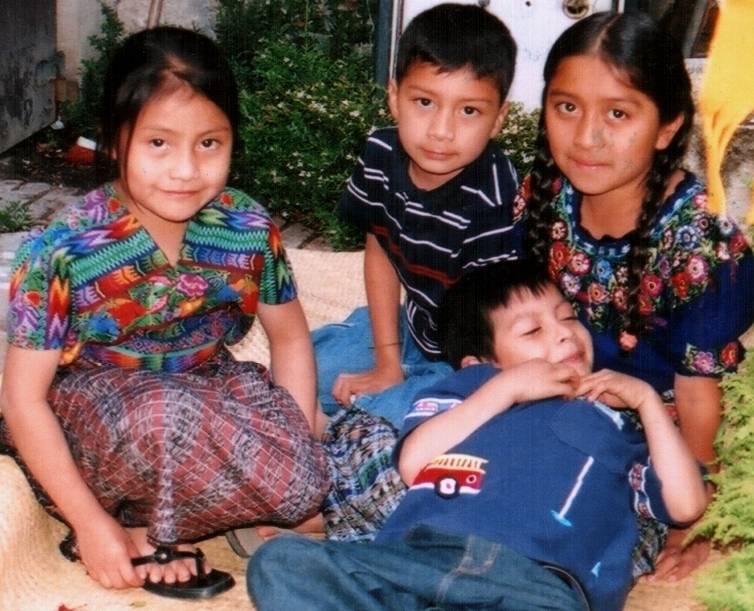 I went on from Lidia’s home to study with two other weavers in Guatemala but, more about that in another post! 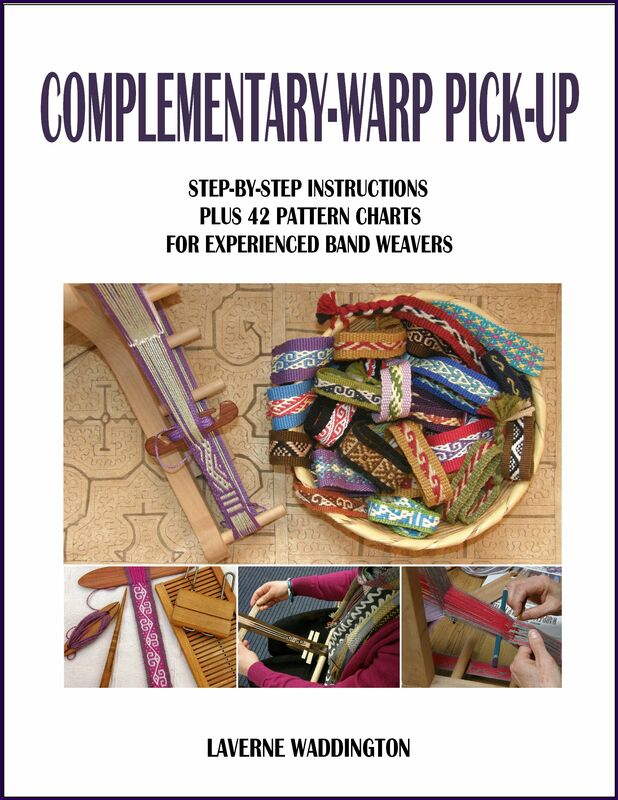 I will be doing a tutorial on suplementary weft patterning with lots of step-by-step photos here on my blog in the following weeks so that you can add designs like the Central Asian and Huni Kuin ones, that I showed you above, to your projects. Beatiful! I love the table runner pattern. Wow! All those colors, a real treat for the eyes. Very inspiring. Before next fall, I now want to make myself a felt hat and weave a pretty band or three for it! Hatbands are a really good way to practice new techniques. How cool to have a handmade hat and hatband (or three). I love those photos ! make me want to travel to south america but that will no happen soon(fear of flying). You are doing a beautiful photography tour and tutorials. I wish I were a fly on your arm so I could see and hear and taste all things – just don’t swat me!!! 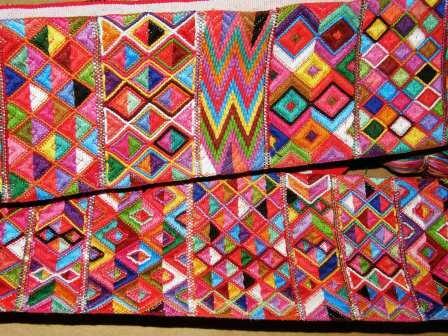 Every email draws me closer to back strap weaving. Question: you have to make heddles each and every time you start a project, right? Would it be possible to place rings on a rod, like the one used, and attach the warp thread to it? For example, could the kind of key rings that can have the keys slipped onto them, be used? Making a lot of heddles sounds tedious but, like anything, with practice it becomes quick and easy. I have yet to come up with a way to avoid having to remake them. The ring idea is interesting but the rings would have to be really big. Remember that when you open the shed with the shed rod, those warps need to be able to pass through the heddles. The warps that are being held by the heddles need to drop down enough distance to allow the shed to clear. Anyone who has made their heddles too short the first time will recognize this problem. Hmm….thoughts are going through my head as I am writing this. Maybe a really long paper clip would work-slim, thin and long-yes, that might do! It would be fun to try this out although making string heddles is such a breeze for me-let’s face it-I’ve had a lot of practice! Stunning. I am so thrilled you are planning to share a tutorial. I so much want to learn more. Your work, photos, and experiences are amazing. Thank you!! Great blog Laverne. Very inspiring. 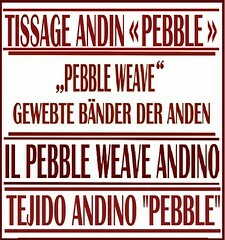 I’ll get back to weaving yet. Am still concentrating on knitting at the moment. Once again….bravo! What a treat!!!! to be able to have a glimpse into this world!! 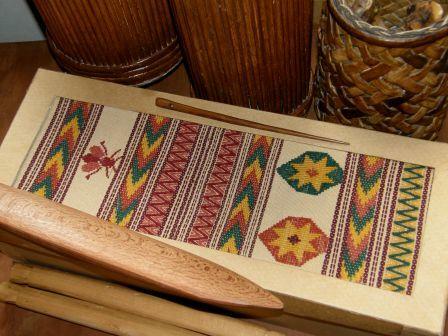 Their weavings,as well as yours, are so incredibly beautiful! You are just so generous to share your knowledge with the rest of us. Thank you!! I have collected hat bands one by one over the years. I don’t know where you could buy them in bulk…certainly not here where I live in Santa Cruz.